Conditions like arthritis and osteoporosis can weaken bones. And, this can lead to one of the more frightening injuries an older person can have: a hip fracture. This sort of injury threatens to affect your ability to physically function. Mobility could be significantly reduced, and making a full recovery may seem like an impossibility. Well, here’s something positive on the health news front about hip fractures and recovery: vitamin E may be able to come to the rescue. Researchers from Baltimore have focused in on a very important part of recovery after a bone has been broken. It has to do with nutrition—specifically, the fact that poor nutritional status after hip fracture is common. And, being deficient in nutrients means a patient is also going to be low in vitamin E. Low serum concentrations of vitamin E has already been proven to be associated with decline in physical function among older adults, so the researchers set out to determine if vitamin E could play a an important role in physical recovery from hip fracture. Serum concentrations of vitamin E were measured in female hip fracture patients who were participating in the Baltimore Hip Studies cohort. The researchers measured for vitamin E at baseline and at 2-, 6-, and 12-month post-fracture follow-up visits. Four physical function measures were also evaluated. In all, a total of 148 women, aged 65 years and older, participated in the study. The research team found that baseline vitamin E concentrations were positively associated with a number of physical function tests. Patients scored better on their walking distance test, their physical gait test, and their ability to participate in varied physical activities. The researchers concluded that serum concentrations of vitamin E were associated with better physical function after hip fracture. This is a simple, natural treatment that could help you out during a difficult time. For another impressive health benefit of vitamin E, see The Alzheimer’s-fighting Vitamin. 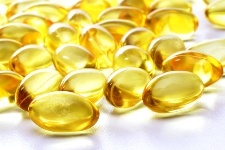 Talk to your doctor about vitamin E supplementation. D’Adamo CR et al., “Serum vitamin E concentrations and recovery of physical function during the year after hip fracture,” J Gerontol A Biol Sci Med Sci. July 2011; 66(7): 784-93.